Courtyard by Marriott Glenwood Springs welcomes guests to enjoy a relaxing stay in the Rocky Mountains with the new Soak & Stay package. The package includes one night stay accommodations, two tickets to Iron Mountain Hot Springs, two towels and one tote to take home after the stay. Package starts at $209 + tax per night. Iron Mountain Hot Springs is a mineral hot springs on the bank of the Colorado River in Glenwood Springs, located just a short five minute drive from the Courtyard. For more information about Iron Mountain Hot Springs, please visit http://www.ironmountainhotsprings.com. One of Glenwood Springs’ newest hotels, the Courtyard by Marriott Glenwood Springs hotel makes your trip to Glenwood Springs, Colorado a memorable one, by providing exactly what the leisure and business traveler requires: clean and spacious hotel rooms with numerous hotel amenities. The newly remodeled lobby features an in-house hotel restaurant, perfect for casual dining with plenty of healthy dining options. All hotel guest rooms feature comfortable Serta beds and 32” flat-panel HDTVs. The hotel offers 600 square feet of meeting space, ideal for small business meetings, training and seminars. The on-site business center has computer workstations with printers as well as free wireless internet throughout the hotel. Courtyard is close to popular attractions such as Downtown Glenwood, Glenwood Hot Springs, the Glenwood Caverns Adventure Park and Iron Mountain Hot Springs. For more information or to make reservations, please call (970) 947-1300 or visit http://www.courtyardglenwoodsprings.com. 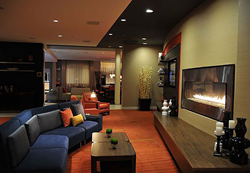 Courtyard by Marriott Glenwood Springs is proudly managed by Stonebridge Companies in Denver, Colorado. Founded in 1991 by Navin C. Dimond, Stonebridge Companies is a privately owned, innovative hotel owner, operator and developer headquartered near Denver, Colorado. Its diverse listing of properties includes select-service, extended-stay, mid-scale and full-service hotels in markets throughout the U.S. For detailed information, visit our website at http://www.sbcos.com.